Based on feedback from several people I've updated the rich client discussion prototype. 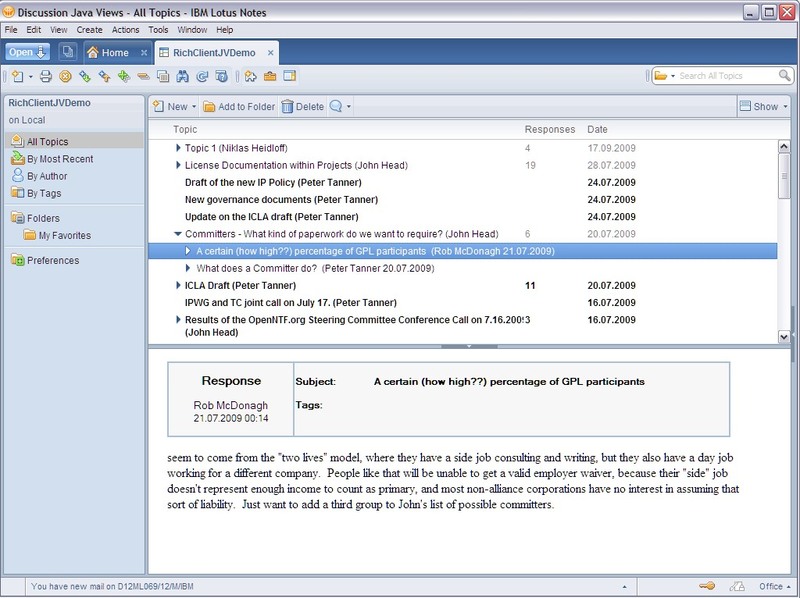 As previously it uses the Java Views on the 'home page' for a consistent look & feel with the Notes PIM applications. The second page comes up when you open a topic or document from a view. This page contains a thread viewer that allows viewing of other documents of the same thread without having to leave the page. 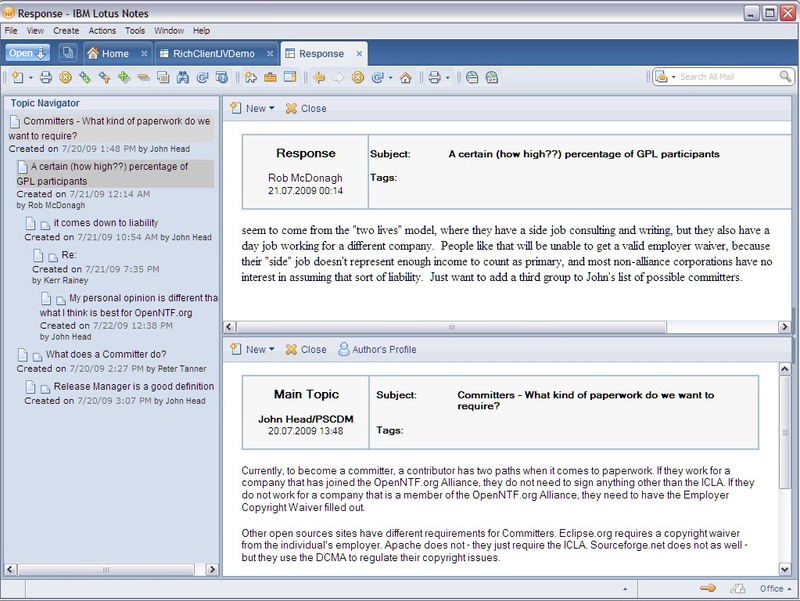 So users can write their response while they are reading other documents of the thread. The biggest change is that the thread viewer has been moved to the left column (see screenshot below). We want the same experience on both pages. On the first page there is the view navigator and the second page now contains the thread/topic navigator. I'm not good in stylesheets but I've tried to make the topic navigator look similar to the view navigator (e.g. same background color, same color for selected entries). From this thread navigator you can open documents in the preview area at the bottom or you can open documents on their own page/full screen. As previously the navigator even shows the position of a new response before it has been saved. Here are some more screenshots: New response, topic navigator, view navigator. These screenshots use real data from the public OpenNTF IP forum. I think they show that there is still room for improvements since the navigator looks a little bit busy. I have some ideas how to improve this but please let me know your thoughts. One idea is not to show creation date and author by default, but only via filter or hover over dialog. Michelle O'Rorke asked whether the conversations feature from mail can be used in the discussion template. I've tried this but the main problem is that the setting 'conversation' vs 'individual messages' is only a global setting. It is not application or even view specific. 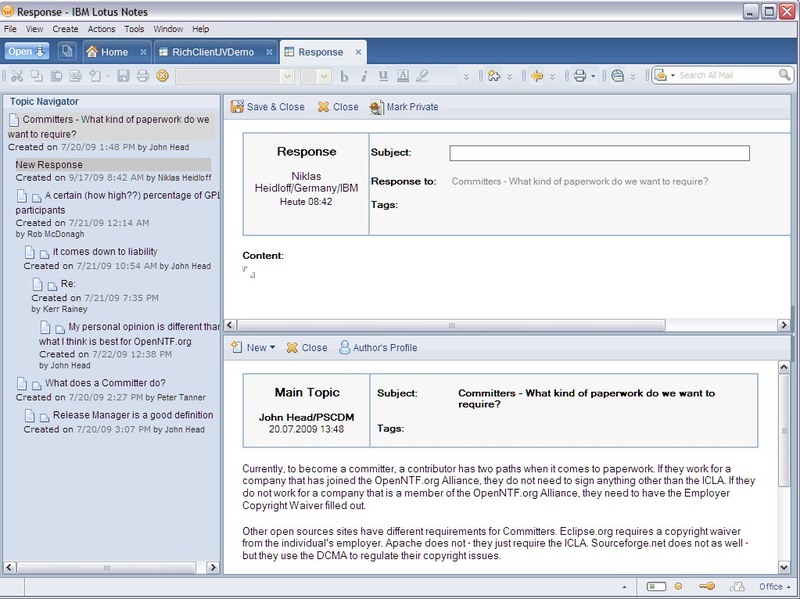 Plus the terminology in the UI uses the words 'messages' and 'conversation' rather than 'documents' and 'topic'. See here for a video of the new thread navigator and the conversations feature.